IS UNEB FAILING STUDENTS WHILE OTHERS GET UNDUE ADVANTAGE? I had opportunity to get someone versed with the marking of UNEB Examinations tell me that some schools have as many as 10 examiners and these have a lot of advantage. he gave me an example where in replying to the Question: Amin had to be overthrown discuss. That the UNEB 'discuss' in this case had only the side that Amin had to be overthrown,those who handled this question the normal way giving two sides could not get full marks. It is also clear that when UNEB makes adjustments,there are a few privileged schools with examiners that get the information timely and do as expected. The truth is that UNEB needs to review the way it does examination business. It is getting cler that even the booklets which students cherish to reduce reading big volumes have been found wanting in some instances such that when students answer questions as per those booklets they end up failing the questions given the UNEB approach. It is also clear that people who have to do with exams leak some information on what is expected giving opportunity to some students to excel while others just fail. the examples are many which call for UNEB reviewing what they are doing. While I believe seriously that Museveni should not have gone beyond 2006, as would be the case if he had any respect for the expensive 1995 Constitution,I wish to submit that the strategy President Museveni uses to dismiss or retire Ministers is not scientific enough. An observer sees that the President disappoints one as long as the electorate have not voted that person as a Member of Parliament, but forgets that many of the electorate disappoint one at times for what may better be termed as flimsy matters for example if the MP fails to help an electorate when approached for money,or even fails to turn up for burial and also not being able to dish out cash as the game turns to a give and take type. The electorate has false expectations many times from MPs and the President on dis-missing Ministers on such reasoning fails as he ends up disappointing people who deliver. Much as Namirembe Bitamazire is old,when you look at the corruption factor, she is the type the President would retain to show his commitment to a corrupt free cabinet. What the electorate vote for is a person who represents them in Parliament, the unfortunate bit is that the President has sort of united the executive to Parliament as he dictates positions which the NRM caucus is supposed to stand by on serious national issues. What he would do is to take serious interest in identifying people who can deliver the country from getting back to the dark ages. Merely getting people who always just have to take his position is derailing the country and having it in back gear on the development front. The mistakes Museveni is making in 5 years now may take decades to rectify. The unemployment by his mis-advised policies are no blessing for the Pearl of Africa.The ever increasing size of the cabinet, the parliament, presidential advisers all show simply how ill advised the country's leadership is. Cabinet chosen on specific scientific scrutiny would possibly take the country a step further, more so the Government would move better with technical people as ministers not stooges. Even the regional balance some how fails to get the point. We need service delivery because we don't eat those so-called balances.Our people need money which has purchasing power,they want their goods bought and good roads,they don't survive on regional and religious balances. A close look of the new cabinet reveals that President Museveni has appointed more ministers from northern Uganda than in his previous cabinets. While the outgoing cabinet had only 10 ministers from northern Uganda, with only two full cabinet posts, this time the number has increased to 18, including Gen Moses Ali, who was appointed 3rd Deputy Prime Minister and deputy Leader of Government Business in Parliament. Christine Androa took the powerful Health ministry while Hilary Onek is the new Internal Affairs minister. When you consider that, in addition, Jacob Oulanyah was recently elected Deputy Speaker of Parliament, it becomes clear that the political fortunes of the region have improved in light of President Museveni’s impressive performance here in the last elections. The President won with 56.9% in all the sub-regions of Teso, Lango, Acholi and West Nile. This was up from a paltry 20% in the previous elections. But what do the individual appointments really mean? Moses Ali’s appointment is significant only because he hails from the region. His influence in the region and in the party appears to have waned over the years, leading to his defeat in the 2006 elections. However, he bounced back in the February elections and so deserves his place at the high table. Nevertheless, questions will be asked about his ability to deputise Mbabazi as leader of government business in Parliament since he is not known to be eloquent or assertive. Museveni’s appointment of Maracha MP, Alex Onzima, who defected from FDC last year, could be taken as a clear ‘thank you’ note for the mobilisation Onzima undertook in West Nile. That notwithstanding, many long-serving NRM ministerial hopefuls will be disappointed at the quick promotion of a new convert. Rebecca Amuge Otengo’s appointment as minister of state for northern Uganda also invites criticism. Another convert from the opposition (UPC), the appointment is to reward her for aiding the NRM juggernaut in Lango and perhaps remind other opposition leaders in the sub-region that it pays to join the ruling party. The appointment of Betty Bigombe was seen coming, although it was expected that she would get a more influential post than minister of state for Water. Having served this government before and twice spearheaded peace talks with Joseph Kony’s LRA, besides her international profile, she was bound to bounce back as soon as she won the elections. Bigombe, who holds a postgraduate degree from Harvard University, was formerly minister of state for Pacification of Northern Uganda before working as a consultant of the World Bank’s Social Protection and Human Development unit. Few will begrudge Erute South MP, Sam Engola, of his appointment as state minister for Lands. He is a long-time loyal cadre of the NRM and remained true to the party even after he lost election after election in a region that was politically hostile. Museveni’s choice of ministers in Buganda draws mixed feelings. While there are now more ministers (20), including 10 full cabinet posts, most of these individuals have not had a healthy relationship with the Mengo establishment. Rose Namayanja (state for Luwero Triangle), James Abraham Byandala (Works and Transport), Edward Kiwanuka Ssekandi (Vice President) and Muruli Mukasa (Security) have all been perceived as opponents of Mengo at one time or another. However, Buganda will be happy with the appointment of new Bamunanika MP and former kingdom minister, John Chrysostom Muyingo, who becomes minister of state for Higher Education. Radio One proprietor Maria Kiwanuka, the surprise minister of Finance, Planning and Economic Development, is also known to enjoy a good relationship with the Mengo establishment. Indeed, many have expressed surprise at retired junior army officer Alupo’s appointment. It is possible the President was under pressure to give a full ministry to Teso and Alupo happened to be the most deserving of the MPs from the sub-region. In Buganda, the President appears to have ‘rewarded’ MPs who stuck with his government even in the face of spirited Mengo opposition to bills on land and cultural leaders. Namayanja, Byandala and Peter Nyombi fall in this category. According to Lukwago, the choice of Buganda ministers shows that Museveni has an agenda against Buganda. The elevation of Jessica Alupo to full cabinet minister (Education and Sports); the appointment of Irene Muloni to the powerful ministry of Energy and Mineral Development; Dr Stephen Malinga (Disaster Preparedness and Refugees); Daudi Migereko (Lands, Housing and Urban Development), alongside 15 ministers of state, is Museveni’s reward for the region’s support in the elections. One of the surprises here was the elevation of Janet Museveni’s Karamoja portfolio to full cabinet ministry, complete with a minister of state. The demotion of John Nasasira to Chief Whip is also noteworthy. Some have argued that the elevation of Karamoja Affairs is because Ms Museveni could not hold a lesser ministerial position than that of her former staff in State House, Amelia Kyambadde, who was appointed full minister of Trade and Industry. Others say that the First Lady would not bear working under the new Prime Minister, Amama Mbabazi, with whom she has differences. The Office of the Prime Minister was previously responsible for supervising the Karamoja Affairs portfolio. The country had been without a Cabinet since Museveni dissolved the old one a few hours before he was sworn in for another five-year term on May 12. By announcing the list of the 69 new ministers without consulting most of them, including first-time nominees, and without detailing portfolios, Museveni showed that he still firmly retains all the cards in the power structure. In his new line-up, Museveni dropped three ministers adversely named in a corruption probe, handed an olive branch to former political foes and rewarded little-known party officials who helped him win the February election as he sought to appease critics of his governance record, weaken the opposition and roll the pork barrel towards those in his National Resistance Movement party. The Health Ministry was purged of ministers Jim Muhwezi, Mike Mukula and Alex Kamugisha after the trio were adversely named in a judicial probe into the mismanagement of the $210 million Global Fund on Malaria, Tuberculosis and HIV/Aids. A spokesman for the ruling National Resistance Movement, Ofwono Opondo, told The EastAfrican that although Justice James Ogoola who is leading the probe is yet to release his final report, President Museveni "was responding to the public mood" in relieving the trio of their duties. The sackings follow Museveni's recent public vow to fight corruption in his government – and pressure from Western donors. A British diplomat in Kampala said that they "would have found it difficult" to live with a Cabinet that included the three ministers. State House insiders are quick to point out that Museveni was not acting merely to appease donors, who cut $73 million in aid last year over concerns about governance – but the sackings will not harm relations, and a quickly-arranged tour with Western diplomats of mass graves in the Luweero Triangle to help explain Uganda's human-rights record shows Museveni will seek to mend fences with the West – or at least explain himself better – to repair his international reputation, now at its lowest in years. If the sackings took Museveni one step forward in the fight against corruption, he took two steps backward by appointing his younger brother, Lt-Gen (Rtd) Caleb Akandwanaho, aka Salim Saleh, a decorated bush war veteran and former army commander. Saleh, a populist philanthropist who wields considerable behind-the-scenes influence, was named in several corruption scandals in the 1990s, including the purchase by the army of junk helicopters in 1998, for which he received a commission of $800,000. He was involved in the sale of the former Uganda Commercial Bank and was also accused by a UN Security Council report of illegal exploitation of DR Congo's natural resources. Saleh told the parliamentary appointments committee that he was now a "better person" and "better focused" and that they should focus on his future, and not his past. It is advice that the country should take; although he is likely to start off in low gear as a minister of state, he is too powerful to stay there for long and will probably rise to a more senior posting. With First Lady Janet Museveni newly arrived in parliament as MP for Ruhaama, and Museveni's son Kainerugaba Muhoozi, a senior officer in the Presidential Guard Brigade, taking an increasingly public profile in the local press, Saleh's accession to the Cabinet will only heighten talk – and fears – of an in-house succession should Museveni choose to step down in 2011. The unexpected inclusion on the list is Eriya Kategaya, a former deputy prime minister and Museveni's childhood friend, who was sacked in 2003 for opposing the president's controversial but successful attempt to amend the constitution to allow him to stand for another term in office 20 years after he came to power. Kategaya was the most senior in a trio, including former local government minister Jaberi Bidandi Ssali and former ethics minister Miria Matembe, sacked for opposing Museveni's ambitions. Kategaya flirted with opposition leader Dr Kizza Besigye's Forum for Democratic Change after falling out with Museveni and was appointed an "envoy" in the party. His return to the Cabinet was being celebrated as a coup by State House staffers when The EastAfrican spoke to, although furious FDC officials demanded that he explain his defection. Insiders say Kategaya is likely to head the new Ministry for Regional Co-operation, a position that will allow his diplomatic skills to flourish. President Museveni had earlier promised to work with "principled" members of the opposition and he named a handful, including Omara Atubo, Kagimu Kiwanuka, Dr Stephen Malingha and Ephraim Kamuntu, to the new Cabinet. President Museveni also named a few experts, including computer expert Ham Mulira, hydro-engineer and MP Hilary Onek as well as electrical engineer and MP Simon D'Ujanga, who are expected to lead the newly-created Ministry of ICT and help find solutions to the country's biting energy crisis respectively. Despite the tentative steps towards a Cabinet of experts, President Museveni's special assistant on political affairs, Moses Byaruhanga, told The EastAfrican that it was unlikely that the new Cabinet ministers would sign performance contracts. The new Cabinet list has given Museveni a chance to dispense patronage by bringing in new faces while cutting out the deadwood in his government; all the ministers who lost their seats, save for one, Okello Oryem, were dropped. Museveni, however, retained many close allies, including Vice President Gilbert Bukenya and Prime Minister Apollo Nsibambi. Other ministers retained include Amama Mbabazi (defence), Sam Kuteesa (foreign affairs) and Syda Bbumba (energy). 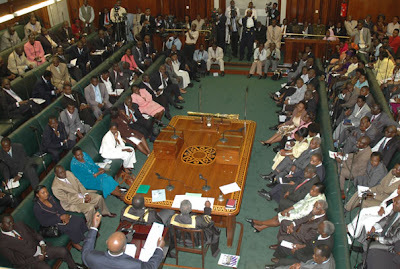 Some ministers who did not stand for parliament or who lost in the party primaries, such as Crispus Kiyonga, Ruhakana Rugunda (internal affairs), Ezra Suruma (finance), Henry Kajura (public service) return to Cabinet but will not need reminding which side of their bread is buttered – or who wields both the knife and the butter. President Yoweri Museveni last evening dismissed as "nonsense", suggestions by the donor community that Africa needs small and efficient governments. Museveni was addressing cabinet ministers and ministers of state who had just taken oath of office at the International Conference Centre. "I have refused to agree with those people who say in Africa you need small but efficient governments. The problem of Africa is under governance and not over governance. This is confusion and I am not a confused person. The donors [who are saying this] recognized Idi Amin when he took power, I can't accept that nonsense," Museveni said. Don't let Europe's position as a development champion slip: lead the world by increasing spending on effective aid in the next 7-year budget. It’s been hard to miss the news: the International Monetary Fund (IMF) is looking for a new boss (as Dominique Strauss-Kahn recently resigned). And they’re planning to fill the position very, very soon. In the past, this job (along with the top World Bank position) has been a bit of a gentleman's agreement' between Europe and the US—so a European usually gets this top IMF job. But this time let’s make sure the IMF knows that we expect an open and merit-based process that gives everyone a fair shot at the top spot. Please run a fair, transparent and merit-based process while looking for a new head of the IMF so that the best candidate, regardless of nationality, wins this crucial job. So why is this such a big deal? Because the IMF sets key global economic policies that impact the world’s poorest people (take debt relief, for instance). And way back in 2009, after being pressed by groups like ONE, the IMF agreed that the next head would be selected by an “open, merit-based, and transparent” process—and the US Treasury Secretary said the same. We really hope those words are true. But we’ve seen them swayed by powerful countries in the past—and the world has changed too much for history to repeat itself. That’s why we’ve started this petition. It’s our way of letting the IMF know that we’ll be watching for an open process and that we can’t limit this search to just 1/7th of the world. As former South African Finance Minister Trevor Manuel so aptly said, this is not a time for birthright to be more important than ability. The world—and ultimately lives—could depend on it. WILL MARIA KIWANUKA HELP BUGANDA GET ITS MONEY FROM THE CENTRAL GOVT? Radio One Managing Director Maria Kiwanuka has been named Finance Minister. Yes, Maria Kiwanuka is appointed Minister of Finance, the challenge is that she is coming on a Buganda Ticket, whether she will have the mandate to settle the long outstanding bills which are owed by the central Government to Buganda arising out of a deliberate plan to frustrate Buganda. Wish her best of luck in the new job. President Museveni last night dropped about 25 ministers, in Cabinet whose biggest surprise was probably the appointment of Radio One Managing Director – Maria Kiwanuka as the new Finance Minister. Ms Kiwanuka, who hold a master of business administration for the London Business School and worked at the World Bank as a financial economist has not been in active politics. In other new faces, Abraham Byandala is new minister for Works, bringing to an end, Eng. John Nasasira’s 15-year stint in the roads sector; Peter Nyombi was appointed Attorney General, Irene Muloni is Minister of Energy, Amelia Kyambadde is minister of trade and industry, Adroa Christine is minister of health while Mary Karooro Okurut is the new minister of information and national guidance. Former Kampala Mayor Nasser Ntegge Ssebaggala, who only crossed to the ruling NRM last year has been appointed to cabinet as minister without portfolio. In other surprises Mr Henry Banyenzaki, known in the previous parliament as one if the ruling NRM ‘rebel’ MPs for taking a critical stand against government policies has been appointed a state minister for economic monitoring in the office of the president. Among other new state minister faces also include Namayanja Rose (Luweero Triangle), Saleh Kamba (Bunyoro Affairs), Rebecca Otengo (Northern Uganda), Nyiira Mijumbi (Agriculture), John Chrysostom Muyingo (Higher Education), Mbabali Muyanja (Investment), Caroline Amali (Microfinance), Sam Engola (Housing) James Mutende (Industry), Agnes Akiror (Tourism) and Alex Onzima (Local government). Former third deputy Prime Minister and Minister of internal Affairs Kirunda Kivejinja led the list of those exiting Cabinet with Hope Mwesigye (Agriculture), Aggrey Awori (ICT), Omara Atubo (lands), Namirembe Bitamazire (Education), Janat Mukwaya (General Duties), Gabriel Opio (Labour) and Tarsis Kabwegyere (Relief) among others, all dropped, having failed to retain their parliamentary seats. Seven Minister retained their Cabinet portfolios, with the First lady Janat Museveni retaining her Karamoja portfolio, which has been elevated to a full cabinet ministry. Eng. Nasasira leads the list of those retained but moved to less influential dockets. The former works minister has been named Government Chief Whip. Others shuffled include former AG Prof. Khidhu Makubuya who has been appointed minister for general duties in the office of the PM. Maj. Gen. Kahinda Otafiire has been moved from the ministry of trade to ministry of justice while Stephen Malinga has been moved from health to relief and disaster. Lt. Gen. Moses Alin lead those who are making a comeback to cabinet – after he was named 2nd deputy premier and deputy leader of government Business, Muruli Mukasa was named minister for security Ruhakana Rugunda was named new minister for ICT while Tress Bucanayandi is minister for Agriculture. Alupo Christine, formerly a state minister for children affairs was promoted to full Cabinet Minister for Education and Sports. On a serious note, Nasser Sebagala has been appointed to a Ministerial Position, however, the appointing authority ought to be aware that the guy's language is bad. Sebagala needs serious language classes to enable him transform his crude and mechanical English to the polished type that is expected of a guy in his position. What is most unfortunate about Sebagala when he is expressing himself, he more often than not emphasizes points when the language is very wrong. Government should help him get training to master the language expected of a person of his status. Does Speaking English fluently measure someone’s intelligence in Uganda? Some Ugandans have been criticizing Vice president,Dr.Bukenya’s fluency in the English language, particularly when he appeared to be struggling with English at a business forum in India as indicated in the youtube video:http://www.youtube.com/watch?v=yNdb1n4MyWM&feature=related. The same group have called for president Museveni’s press secretary,Tamare Mirundi’s head, because he cannot also express himself properly in English during press conferences. Others have also been mistakenly praising the president of one of the DP factions, Norbert Mao’s oratory skills for intelligence. Some have even, out of ignorance, said that Mao is more intelligent than the Mayor of Kampala, ‘illiterate’ Sebagala . But what is the truth in whole this? Normally a person growing up just hearing a language will not speak it as a native speaker or someone that language is a mother tongue. However, if one begins speaking a language on a regular basis, one usually keeps an accent all their life. For instance, some of us have developed funny accents because of the regions where we live in Britain but does it mean that we can express ourselves better than Bukenya or Tamare Mirundi(presidential Press Secretary)? The answer is ‘no’. For all practical purposes, a person speaking a language at mother tongue level is a native speaker. Therefore, Dr.Bukenya cannot speak English in the same way as an English man or like some Ugandans who have been abroad for ages. A native speaker may once have meant “native” in the original sense of the word, i.e. born in that country, but now it just means a person who grew up speaking that language – which is the only way to get perfect in one language. Indeed, a lot of people that pass through educational institutions in Uganda can express themselves in English, but are not (and may never be) as good at English as a “native speaker” or someone who has lived abroad for years. So when Tamare Mirundi speaks English, he represents a large group of elites in Uganda, and this is ok as long as people understand what he is trying to say. Again, it is not just about grammar. Understanding the various regional differences of English or American English can be quite challenging as well. For instance, I can bet several Ugandans would not understand a thing when they hear an English man from Yorkshire or Liverpool(UK) addressing them because of the accent. In the UK itself they accept people that know how to express themselves in good English but they don’t demand them to be from Anglophone countries, or speak English fluently. This means that Dr.Bukenya or Tamare Mirundi can get any job they want in the UK with their level of expression in English. I am no expert on all these matters, but my personal experience is that there are really big differences between individual people. There are those who live in a country for more than 20 years and still speak the local language with a heavy accent while others are really hard to identify as non-native speakers after only three or four years. I don’t know what the reason for this is. But of course it does not often happen that people have to be perfect in the language, and I don’t really think this is necessary. If we want an open society in Uganda, we have to be more tolerant against people not perfectly speaking our languages or any foreign language such as English. For instance, there are many people who are native Luganda speakers by birth, like me, but who speak a highly ungrammatical language that is not really rich on vocabulary. Many non-baganda beat their level of language. It can also be proven that even a native speaker’s fluency is his/her own language can diminish given enough time in another linguistic environment. There has been several notable Ugandans example of this, but I won’t go into it. Let me also correct people one thing: Ssebagala Nasser is not an illiterate man as he can read and write. He can read and write Luganda fluently. He can read English but cannot speak it fluently. So their use of the word ‘illiterate’ is totally misplaced. But then again, history has shown that illiteracy is not in any way a measure of one’s intelligence. For instance, according to Islamic scriptures, prophet Muhammad (SAW) never knew how to read and write but he managed to spread Islam under very difficult conditions, and Islam today has got second biggest following after Christianity. It is true that wealthy people are generally more intelligent than average all over the world. But this is not the same as saying that the current Mayor of Kampala,Hajji Sebagala, is more intelligent than Mao, but it is very possible. I don’t know, but it’s very possible, since intelligence is very difficult to quantify.My argument here all hinges on the word “generally,’ and I hope some people don’t equivocate on the meaning of that word. Yes, there is a distinct subset of wealthy people that are less intelligent than average but overall the rich tend to be smarter. That is a fact! Alhajji Ssebagala, James Mulwana and most rich Kampala men are more street smart than the likes of Mao, and they are probably more intelligent than the likes of Mao. Probably, if Ssebagala had decided to invest more of his time in first acquiring more degrees before business, ‘theoretical’ elites would now be calling him so intelligent, because their definition of intelligence is on how much qualifications someone has got. Look, Uganda, unlike USA or UK, people just don’t become rich through stockbrokers and mutual funds. One has to be ‘OMUYIYA’(creative) to make it to the top. Those who make it through straightforward means: acquiring education, getting a job, and becoming rich, are not many. But Pessimists are people who believe in elites and governments. They believe that famous college professors are smarter than ordinary men and women, which is totally wrong. There is this false idea that education = intelligence. Education may lead to understanding of intelligence, but it can just as easily lead one away from their real abilities. We must not confuse education and intelligence with cult of education and intelligence. In many ways, an illiterate Ugandan peasant knows more about human nature, economics, and moral values than some highly educated Uganda bureaucrat steeped in Marxist theory, dialectical materialism, and historicist mumbo jumbo. A person can be highly educated with all the false ideas and idiocies. Only the CULT of education says that a person is more intelligent simply because he’s read more books, has earned a Ph.D. and given lectures. For instance, I know a lot of uneducated men in Bugerere at Kisega Village, including my grandfather, who act more intelligent than this crop we have now got from Makerere university. For 1000s of years, the most highly educated Chinese believed that business was dirty and exploitative, and so China did not make economic progress like the West. One can study for years and years, but if the ideas are false or misleading the educated can be more stupid, naive, and ignorant that those who learned of reality through everyday experience. Norbert Mao saw Ssebagala losing the trust of Ugandans by leaning himself more towards president Museveni and NRM, but the ‘intelligent’ Mao has been publicly praising president Museveni several times. The ‘intelligent’ Mao thinks that a fragmented opposition can stop NRM from leading Uganda for more 30 years. That’s why I discourage people to go for postgraduate studies for the sake of beautifying their CV. One needs to find himself before going for further studies. We have all got abilities which we never exploit just because we are rushing to impress the society and those around us. Is Mao more intelligent than Ssebagala? Intelligence can’t even be quantified, let alone measured – and I see zero evidence anywhere that Mao is more intelligent than Ssebagala. If we define intelligence in terms of “success,” then Ssebagala has done well for himself than Mao.Speaking English fluently does not make Mao more intelligent.For instance,the computer with an NLP software understands plain English -but it is only as intelligent as its rules & database allow it to. It cannot acquire intelligence or use common sense. Overall, we should all respect each other and never to make a mistake of measuring one’s intelligence, perfection or literacy depending on their fluency in a language. Yes, English is very important and we should all strive to learn it because the prevalence of English as a language of commerce and of technical communication easily connects us to the global village and global opportunities. It’s one of the reasons why I have been advocating for its promotion in East Africa at the expense of Swahilli. It is normal for the Government of Uganda to keep re-allocating land use as is the case with the Museum. Our prayer is that that temptation is not extended to the Entebbe Botanic Gardens, a 40 hectare piece of land. There is all the hope that the Government will respect the Strategic Plan by NARO from 2009 to 2018. The Gardens are the only National Botanic Garden in Uganda. On establishment in 1898, the Botanic gardens were a reception centre for introduced crops such as Cocoa, Cotton, Coffee, Tea, Oil Palm, Sisal to mention a few. 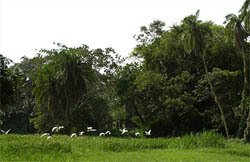 The land is a topography of wide range of micro habitats ranging from tropical rain forests, natural springs, sandy well drained soils, poorly drained marshy areas supporting the swampy vegetation as well as the shrubby areas typical of open savannah, with birds, monkeys, spiders to mention some. The garden is situated along the northern shores of Lake Victoria giving it an excellent view of the lake. There are 360 plant species of which 199 are indigenous to Uganda, 122 known for traditional medicinal value and 110 exotic plant species. The Entebbe Botanical Gardens established in 1898 are situated on the northern shores of Lake Victoria virtually on the equator. Experiencing an annual rainfall of 1623 mm and at an altitude of 1134 metres the gardens are set in 40.7 hectres. The gardens house a collection of species of plants of the tropical, sub-tropical and temperate zones, besides several shrubs and other plants regenerated naturally over the years.The collection as of 1998 numbered 309 species, 199 indigenous to Uganda, 122 with known medicinal value and 110 exotic. The gardens are a popular attraction for visitors of which some 40,000 per year are passing through the gates since the rehabilitation in 1998. Dr. Muyingo's office at Uganda Martyrs Namugongo was simply tick. I visited the school on a Career's Day but to date, I have never forgotten the impression of the Head teacher's office. Dr. Muyingo has the challenge to see that the Government implements a worthy Educational Loan scheme. The problem NRM Government has is failure to take on professional advice. The scheme is very workable if it is not politically messed up that is why its management should be left to professionals not political opportunists. Dr. Muyingo s taking on the Ministry at a time when cheating to pass exams is real. It is likely that much of the cheating has the role of politicians who have infested nearly every thing in Uganda. Hopefully,the Doctor will help to see as top to the so-called Government sponsorship which only promotes more cheating to pass exams. He has the challenge to see the useless forth at HSC get scrapped. We are aware that women have played a key role in supporting the NRM Government, so they clearly have a right to demand what they deem is due to them. However, the statistics show that women are disadvantaged on many fronts. Those who are fighting for the women rights should endeavour to show women the right things to do, for example have smaller manageable families after practicing family planning. One cannot expect the Government given the trend so far for the 25 years to change all of a sudden. Women should endeavour to have some money on them as they plan to produce hence stop producing as if in a race to see who can produce most. Hundreds of concerned women, men, medical practitioners and people living with HIV/Aids on Friday, stormed the Constitutional Court to hear a case filed against government’s high maternal deaths. The matter arose in March this year when a civil society group, Centre for Health Human Rights and Development together with three individuals; Prof Ben Twinomugisha, a lecturer at Makerere University, Ms Rodah Kukkiriza and Mr Valente Inziku dragged the Attorney General to the Court. Clad in black T-shirts with words: ‘Not another needless death: Government stop the deaths of mothers now!’, the activists converged at the court premises at 8am and remained devoted throughout their stay. 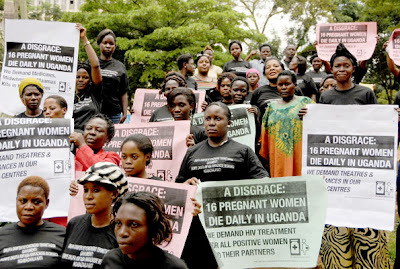 The group accuse government of, among others, for failing to provide basic indispensable maternal facilities in government health services leading to high maternal deaths. They further claim to be affected by the imprudent and unethical behaviour of health workers towards expectant mothers, an act, they say, is inconsistent with the Constitution. At least 16 expectant mothers die each day during child birth or soon. However, the State was not represented at the case which upset lawyers of the petitioners led by Mr David Kabanda. But this did not deter Court registrar, Erias Kisawuzi from moving to hear Mr Kabanda’s conference notes after which, he gave him an audience. The registrar advised the lawyers to put their petition in order by June 7 and thereafter see if they could fix the matter for hearing citing a backlog of cases and judgments the justices have to attend to next month. The petitioners want court to compel government to compensate families of mothers who have died due to negligence of health workers and none provision of basic maternal health care packages and be compensated because of rights violation. However, the government in its defence suggests that the disciplinary committees of nurses and mid wives council and the medical and dental practitioners should address the issue involving unethical behaviours among medical workers. The government also claims the petition is speculative, discloses no question for constitutional interpretation, lacks merit and that it should be dismissed with costs. According to the trends in maternal mortality between 1990-2008, the leading causes of maternal deaths include, massive shortage of trained professional health workers to attend births and lack of access to emergency obstetric care. The NRM Government under President Museveni has failed to understand that Government sponsorship long time ago lost usefulness. Instead, the scheme is publicity for some schools that use the publicity to milk as much money as possible from the parents. I say it is a useless scheme simply it benefits those who have yet when they would be the ones to pay, hence leaving out the poor who are a better asset for the country. It is unfortunate that the NRM has failed to see the fact and instead keeps promoting it. It is also true that many students who qualify for the scheme not only fail to sustain the so-called academic Excellence they showed but many of them are non performers to the extent that for certain cause like Statistics because the Registrars are aware, they openly tell students at registration that in case they are sure that they don't know the stuff they better not register. The cheating is real and UNEB has failed to do anything worth about it. It is also possible that some people at UNEB are shareholders in excelling schools or at least facilitate the leaking of exams which is real. The only service NRM Government can do for the people of Uganda is to scrap the Government sponsorship. St. Mary’s Kitende S.S. has the highest number of candidates that scored quadruple A in the recently released Senior Six exams. The A, which is equivalent to six points, is the highest possible mark a student can get in an S.6 exam. This means Kitende will most likely send the highest number of candidates to Makerere and other public universities on government sponsorship whose selection is about to get underway. Kitende which was also the school with the highest number of first grades at Senior Four last year, 371, has 37 Senior Six candidates who scored quadruple A.
Uganda Martyrs’ Namugongo follows in the second position with 17 candidates with quadruple A and Kawempe Muslim S.S. with 15 is in third place. Seeta High School with 13 is fourth; Mt. St. Mary’s Namagunga with 12 is fifth while Makerere College School with 11 is sixth. Kibuli Secondary School and Naalya S.S. Bweyogerere with 10 each have tied in the seventh position while King’s College Budo and Naalya S.S. Namugongo each with nine are number nine. When Makerere announces the cutoff points, it will be these schools in the lead. Again St. Mary’s Kitende with 75 has the highest number of candidates who scored triple A. It is followed in second position by King’s College Budo with 36, third is Namugongo with 35, Naalya S.S. Bweyogerere is fourth with 28 and Kibuli S.S. with 25 is fifth. Makerere College School is sixth with 22; Mengo Secondary School is seventh with 21; Buddo Secondary School and Namilyango S.S. with eight each are eighth while Kawempe Muslim and St. Mary’s Kisubi with 17 each are tenth. Below, we give you a full list of schools and the number of As each candidate scored. The table considers schools only with at least a candidate with two As. Schools with candidates who scored one A are not included. It is common knowledge that the Uganda Budget is normally read on 6th or there after of June. This time round, it is not clear whether by that time the new cabinet will even know the constraints in their ministries. For one to be effective he/she should have an in put into how things are to run in the course of the Financial year. The monitoring reports from Ministries show a lot of things going wrong, and a new minister could have a strategy which calls for funding to have better results. The writer is a Kenyan volunteer and activist based in Nairobi, Kenya. Uganda's Parliament is simply a drain on the economy, you imagine a 375 strong Parliament for a least developed country like Uganda is unfortunate. Yet, what the executive wants just sails through because the NRM has numbers. Yes, the vicious circle of poverty will continue. A week after they were sworn-in, MPs yesterday demanded that government extends a Shs50 million advance to each of them among other proposals for an upward review in pay and a removal of taxes on cars which they will buy under the already generous motor vehicle loan scheme. To have their way, the lawmakers chased away journalists and stopped coverage of a plenary debate where they reportedly agreed to push for a pay raise in a move, according to sources, which is intended to shield them from rising cost of living biting other Ugandans. In an unprecedented move, Speaker Rebecca Kadaga agreed with a proposal by Kasilo MP Elijah Okupa backed by Nakaseke Woman MP Rose Namayanja that all journalists be kicked out of the plenary. All closed circuit television cameras which beam plenary sessions to offices inside the Parliamentary Building were also switched off and parliamentary police officers were asked to make sure that the confines of the Chambers were out of bounds. The demand for an increase in pay is likely to renew debate over the bloated size of Parliament and whether MPs should be allowed to determine their salaries and allowances. In March, President Museveni questioned the logic of the constitutional provision allowing MPs to determine their own remuneration, a privilege that he said could be abused. While Ms Kadaga later told journalists that this closed session of the House mainly discussed proposals on how to protect new MPs from conmen and manipulative money lending institutions, sources who attended yesterday’s sitting said. Other MPs told Daily Monitor that their colleagues demanded brand new vehicles instead of buying second-hand cars. “Other members want government to increase the car facilitation scheme to enable members gets new vehicles,” a source said, adding: “There was also a proposal to increase on the mileage (fuel), monthly emoluments and other allowances. But Speaker told us that all these matters will be handled by the Parliamentary Commission.” The source added: “Well, some MPs in principle agreed that the salaries and allowances be increased owing to the rising cost of living but others suggested that we close debate on the subject so that we can raise it in other fora outside Parliament. According to sources, Iganga Municipality MP Peter Mugema and Kajara MP Stephen Tashobya, among others, proposed that the pay for legislators be increased to take care of the double-digit inflation which has officially surpassed 14 per cent according Uganda Bureau of Statistics figures. However, other sources told Daily Monitor that there was also another proposal to increase the consolidated pay for a MP from Shs15 million to about Shs19 million. If the yet-to-be constituted Parliamentary Commission endorses the proposal, taxpayers would fork out more than Shs7.1b every month to pay the 375 MPs in the House and Shs85.5b annually to facilitate lawmakers. The proposal came a day after MPs passed a resolution to increase the number of Cabinet ministers from 21 to 29 and state ministers from 41 to 47 whose salary and that of the MPs would be shouldered by the already over-burdened tax payer. According to sources, former Parliamentary Commissioner, Ms Justine Lumumba (Bugiri MP), reportedly supported the idea of raising emoluments. While sources told Daily Monitor that the idea of increasing MPs salaries mainly came from new MPs, sources named Obongi County MP Hassan Fungaroo Kaps as one of those who demanded “brand new and powerful cars” and insisted that lawmakers should not get second-hand vehicles. Kyadondo East MP Ibrahim Ssemuju walked out of Parliament shortly after journalists were asked to leave—protesting the Speaker’s decision on a matter of national significance. Government bound to make money out of the acts of the opposition. Now these fellows whose vehicles are registered as having hooted are not safe as they may be held by Police and to be free and or recover vehicles they will have to pay, not forgetting the embarrassment they may face in the course of being arrested or deciding to leave the cars parked home! People must be extra careful when wanting to participate in such. DID YOU HOOT ON MONDAY? Police are hunting for drivers or owners of 130 vehicles with the intention of arresting them for allegedly participating in the Action for Change hooting campaign on Monday. Field force units will today mount roadblocks on routes to the city centre to impound the listed cars. Kampala Metropolitan spokesman Ibin Ssenkumbi said the hunt of 67 cars and 72 motorcycles is ongoing. “We are looking for the drivers of these cars on several offences of noise pollution in the National Environment Regulations of 2003 and the Traffic Act,” Mr Ssenkumbi said yesterday. The ride-drive-and-hoot campaign by blowing a vuvuzela or hitting any object was launched on Monday by Action for Change coordinator Mathias Mpuuga. The campaign is a supplementary effort to the walk-to-work protests, called by the pressure group to demand that the government responds to the high commodity prices. The campaign happens every day at 5pm and yesterday, military police were involved in running battles with Kisekka Market vendors, who joined the hoot campaign. Mr Ssenkumbi said some cars obstructed traffic while others hooted repeatedly contrary to the section 9 dealing with prohibition of generation of noise by place and time prescribed in the National Environment (Noise Standards and Control) regulations of 2003. But Mr Mpuuga dismissed the police summons, saying they had no case to answer because the police must prove before a competent court that noise they made was beyond the standard one. “Police should also provide to court evidence in digital manner of the noise each motorist emitted,” Mr Mpuuga said yesterday. The law indicates that anyone convicted of making noise beyond the approved levels is liable to a fine of not less than Shs180,000 and not more than Shs18m or to imprisonment for a term not exceeding 18 months, or both. Police said the owners of the motor vehicles and cycles should report to the nearest police station to avoid arrest. DID ALL THE OPPOSITION PARTIES JOIN IN ELECTING NANDALA? If the working as a group in opposition is to hold any meaning, irrespective of numbers by each opposition party in parliament, at least the choice of the opposition leaders in parliament should have all the opposition MPs present. If that was not the case, I think it would have been better that way. A day after a new Vice President and Prime Minister were named, the shadow opposition government also began taking shape with the Forum for Democratic Change yesterday appointing Mr Nandala Mafabi as Leader of the Opposition in the 9th Parliament. He replaces Prof. Morris Ogenga Latigo who lost his Agago County seat in the February general election. The party, which has the largest number of opposition MPs in the House and as such gets the right to form the shadow cabinet, also appointed Ms Winifred Kiiza (Kasese Woman MP) to the office of Opposition Chief Whip. Mr Mafabi, the former chair of the Public Accounts Committee, was not in the country when his appointment was announced but FDC spokesperson Wafula Oguttu (Bukhooli Central) said he “he accepted the appointment with honour”. The announcements were preceded by heated meetings of FDC’s top management body and National Executive Committee where powers were given to party president Dr Kizza Besigye to appoint the LoP. Mr Oguttu told journalists that when Dr Besigye presented the names, the nominees were unanimously approved after a five-hour debate. Mr Mafabi’s appointment was unanticipated as the close race to the top job had been among Abdu Katuntu, Cecilia Ogwal, Alice Alaso, Kassiano Wadri and Patrick Amuriat. Similarly, Ms Kiiza was not in the picture for chief whip. Sources said she was appointed after the women on the management committee demanded that the position goes to a woman. Ms Kizza said the appointment came as a surprise. The position of chief whip, according to sources, had reportedly been set aside for Mr Amuriat before the female members on the management committee pushed for gender balance. Ms Ogwal told Daily Monitor that her name was on the list until the morning management meeting where it was scrapped off. Asked whether she had prior knowledge on the appointments, Ms Ogwal confirmed that Dr Besiege had earlier on Monday indicated he would pick her as the next Leader of Opposition and wanted to know whether she would accept the appointment. “The president had contacted me on Monday on his lineup for the opposition leadership in Parliament and I told him I was willing to take the challenge,” she explained. However, she welcomed the new development. “The decision of the party is supreme, however, I would have wished the presidents’ appointment to go have been vetted and approved by NEC and not by a management committee,” she said, arguing that in the management committee, persons who also had interests in the very posts were allowed sit be part of the vetting process. Other sources within the party, however, indicated that Dr Besigye preferred Serere Woman MP Alaso, but the management committee felt she was better suited for secretary general, a position she has discharged admirably. Outgoing Chief Whip Wadri stormed out of the meeting, looking unhappy. He was heard telling a colleague that he cannot spend the whole day discussing the same issues. “Time is money,” he said before being driven off. But according to Mr Oguttu, Dr Besigye was looking for someone who is loyal, a good mobiliser, competent, and who has sacrificed for the party. Other factors considered included experience, tolerance, professionalism, and ability to deliver and galvanise the opposition in the House. He said other positions have not been filled because the party president has not met with the people he intends to appoint. “We have to wait until he talks to them and then he sends the nominees to the national executive council to approve,” he said. Born in 1966 in Sironko District, the Budadiri West MP is known for his crusade against corruption while chairing the Public Accounts Committee. 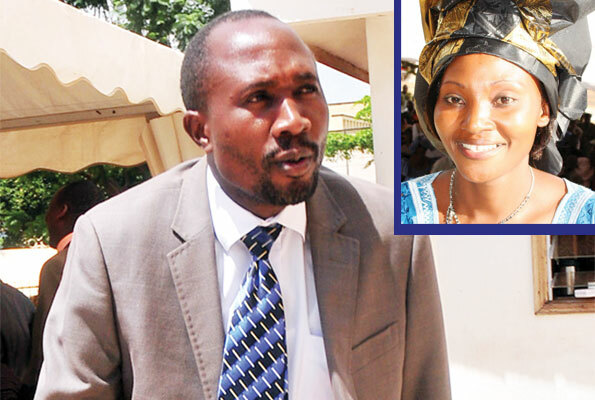 Mr Mafabi heads the Bugisu Cooperative Union and is married with five children. He studied Bachelors of Law and has a Master of Arts in Economic Policy and Planning. He has won the Integrity Award, Who is Who in the World Award, and the ACCA award for best performance. Mr Mafabi lost the race for the Speaker of Parliament to Ms Rebecca Kadaga. The 37-year-old is serving her second term as Woman MP for Kasese District. 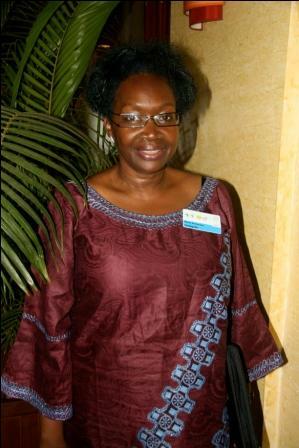 Before joining Parliament, Ms Kiiza was a district councillor from 1998-2005. She also served as a member of the district executive, secretary for defence and also secretary for education in Kasese. Before FDC, she was a member of Reform Agenda where she served as secretary for gender. In Parliament, she served as a shadow minister of local government and by the end of the Eighth Parliament, she was serving as chairperson of the government assurances committee. Corruption is the way of life in Uganda hence not being corrupt is out of the norm. A few days ago, someone said that when the Uganda Police need some operation money and they have no cash on hand, the last resort is to get from the collections made by Traffic Officers on the road. My informer said that this instruction was given in his presence while he was at the Police Station when a Policeman was told to go and get shs 100,000 from those on the road! When talk is made about a country gone to the dogs, it is simply Uganda. The traffic officers have a duty to see that Government gets money from the express penalties issued to vehicle drivers, but that in the execution of this job, not all offenders are issued with receipts, a number pay cash and this cash is what helps so many execute official and non official duties in addition to bridging the not worth talking about salaries these people get given the cost of living in Uganda. When the presidential campaigns were on, we told Ugandan that enough was enough with Museveni’s overstay in Government in that enough damage had been done and time was ripe to see the anomalies rectified, little did we know that NRM uses the poverty of the masses as one means to see its continued governance of the country. Some people are surprised the high cost of virtually everything in the country, but what would be expected when the NRM realized that dishing out shs 30,000 to all who wanted it could earn them new tenure in office. So, who ever thinks that the Museveni Government is seriously interested in fighting mass poverty simply deceives himself. In such circumstances; one finds it a hard struggle to sacrifice to preach and practice no corruption when his or her efforts are not funded. If for instance one has to run an organization to preach no corruption and such an organization is not Government or donor funded you imagine the way he can be able to have an influential mission. Everything is virtually expensive; one has to take children to school where even in the Government aided schools it simply does not make a difference because across the board a parent/benefactor has to raise substantial amounts of money to see the child in school. 1) A form filled by a Private Student applying to the University has to be paid for shs 52,000. What is absurd and unfortunate in the corruption ridden Uganda is the way everybody is unbothered about the shs 2,000 additional fees charged under the guise of Ledger fee, this as far as I am concerned is robbery which the NRM should see stopped. It is not clear whether it is State House where this money is remitted, if it is not so, the Government of Uganda should make sure that this stupid tax is stopped. i. All fees are payable in full at the beginning of the Academic year or in two installments at the beginning of each semester. ii. Every privately sponsored student is obliged to pay all the Functional fees and the Tuition fees before he/she can be registered and allowed to attend classes as well as being issued with the University Identity Card. Payment of all Tuition fees must be completed within three weeks of a semester or else your place will be forfeited to another candidate. iii. The University Council reserves the right to vary fees chargeable any time with or without prior notice. You can imagine the above! That is the structure in a Museveni led Government which claims is concerned about the welfare of the people of Uganda. I don’t know how many people are employed by the Government and have a take home pay of shs 500,000 or more. Does such a fee structure make sense when there is a Government concerned about the welfare of the people it leads? It is absurd that the same insensitive Government is sponsoring the so-called excelling students. These are majority from the well to do who are majority beneficiary of corruption that is the order of the day, the politicians who don’t mind exploiting the people as long as they can live lavish lives. What I can say is the NRM leadership is the most unfortunate thing that has happened to Uganda, and whether this is a punishment the people of Uganda deserve, for once God should have a second thought about it. Uganda’s new number two citizen, certain to win approval of a Parliament he presided over for a record two terms, Mr Edward Kiwanuka Ssekandi will be certain to celebrate a rise from a near fall from political grace. He bowed out of the race to retain his post of Speaker only after it emerged that his former charges disapproved of his continued stay after 10 years on the job. Though re-elected MP for Bukoto Central in Masaka District, Mr Ssekandi is still battling an election petition filed by his main opponent, Mr Jude Mbabali, who says he cheated his way back to Parliament. As he replaces Prof. Gilbert Bukenya, who held the office for eight years, Ssekandi affirms what has come to be standard expectation for the position, a Catholic Muganda as the number two citizen. The appointment also breaks the tradition of a medical doctor being Vice President. Mr Ssekandi is a lawyer. Ssekandi becomes the fourth VP in Mr Museveni’s 25 years in power after Dr. Samson Kisseka, Dr. Specioza Wandira Kazibwe and Dr. Gilbert Balibaseka Bukenya. While Kisseka was defined by his sometimes braggart personality as a man who loathed poverty and Kazibwe was marked more by her often explicit dry jokes on love and sensuality but also her credentials as a women emancipation trail blazer, Prof. Bukenya spent his years as Vice President championing promotion of agriculture, especially Upland rice but was also dogged by explicit tales about his private life. What stood out for all, is that they worked at the bidding of the President and did little to cut clear space for themselves. It is not clear how Ssekandi will cut his own poise. Journalists who have covered Ssekandi in Parliament and MPs he has worked with describe him as calm and composed, reflective but too willing to do the bidding of his party. Whether he will stand up to mark himself out of the shadow of his boss, the President, remains to be seen. A member of the Rotary fraternity, Mr Ssekandi was born on January 19, 1943, in Bulegeya village Kamuzinda in Masaka District. He holds a Bachelor of Laws degree of the University of East Africa and is a practicing advocate. Ssekandi was Deputy Speaker between 1998 until 2001 when he ascended to full Speaker, a position he held until last week. He was also a delegate during the Constituent Assembly from 1994 to 1995 and was Lead Counsel to the Commission of Inquiry into Violations of Human Rights between 1986 and 1993. Before that, Ssekandi was Director at the Law Development Centre between 1978 and 1979 and lectured at the centre before. Ssekandi boasts deep and good contacts and respect in two key institutions to the political balance—the Catholic Church and Mengo, the seat of the Buganda kingdom. WHAT IS THE LOGIC IN 4 PRINCIPAL SUBJECTS AT HSC? Given the administration/weighting procedure; 3 principal subjects are what really counts. In that case, the candidate of case 2 stands far better chances of getting a good course compared to case 1 yet they all have 15 points. The question, what logic in doing 4 principal subjects? Children are made to do 4 principal subjects and no worthy time spent on career guidance and you just find them at a loss as they struggle to choose subjects and courses. Can the Ministry of Education use its mandate to abolish 4 principal subjects such that the students concentrate on 3 subjects and where need be do a subject at subsidiary level, and hence have time to better internalize what they read as well as better guided career guidance which guidance can be put on DVD and schools are able to buy them for the benefit of students more so where the schools may not be able to get professionals to attend to the students over the career issues. As the debate on the relevance and implications of keeping the fourth subject at “A” Level continues, an analysis of recent admissions to university by Education Guide indicates that the Public Universities Joint Admissions Board (PUJAB) still heavily relied on the fourth principle in weighting students for admission to the various courses. Teachers have recently questioned how the fourth principle became an integral part of the examination system. Education experts say the extra subject is burden on students. According to Mr Alfred Namoah, Makerere University academic registrar, university cut off points can only be reduced after Ministry of Education has commissioned it. However, neither universities nor schools seem to specify the origin of the fourth subject principle, which requires a student to score a maximum of 25 points contrary to the 19 points in three subjects in addition to general paper. “It is not us who created the 25 points. This is for the ministry and Uganda National Examinations Board to regulate. Ours is to ensure a student with the highest points is admitted as set by Uneb,” Mr Namoah said. But teachers blame universities for increasing university entry points contrary to the ministry’s requirement. As a result, they reason that schools were forced to abandon three principle subjects for four exerting pressure on schools to hire more teachers in addition to increasing the load that students have to bear. “University cut-*off points are based on a total of 25 points to decide the merit system contrary to the requirement spelt out. This led schools to abandon students offering three principle subjects and general paper, which disadvantages them when it comes to joining university,” reads part of an annual report released on May 5 by National Association of Secondary Schools head teachers. This means that a student who has a combination subject of Physics, Chemistry, Biology and Mathematics (PCB/M) stands a better chance to join institutions of higher learning than one with three subjects. For instance, Charles Okurut, a student, scored ABB1 (17 points) in PCB last year while his colleague Herbert Twiine had ABCC in PCB/M (20 points), leaving the latter with more chances for admission. Meanwhile, a total of 100 students have been admitted on Bachelor of Medicine and Surgery across the public universities with only 28 being female. On Bachelor of Pharmacy, Makerere and Mbarara have 25 students of which three are female. For Bachelor of Law, the female took the largest number of 75 compared to their counterparts who will enjoy only 15 slots. But according to sources on the PUJAB committee but who preferred anonymity to speak freely, most boys are left out on government scholarship not because they have not acquired the marks but because the girls have been added the 1.5 under the affirmative action. “The boys performed well and we don’t know what to do because their score is high. However because of 1.5 added to girls, they are forced out. I hope something will be done not to disadvantage others while trying to solve university female admission,” the source said. Ms Catherine Kanabahita, Director Directorate of Gender mainstreaming earlier said they are working to ensure imbalances are eliminated but cautioned stakeholders. “We are working hard to see that in cases where girls’ admission has improved, it is revised. However, as you will realise, if 1.5 is removed from girls, they would have limited access to universities,” Ms Kanabahita explained. POOR BUKENYA SANG PRAISES FOR NRM AND MUSEVENI, NOW HE IS IN A BIN! Poo Prof. Bukenya has struggled to please the establishment, he tried to mend fences between the President and Kabaka Mutebi, he went to encourage the growing of Upland rice for poverty alleviation, even at a time when Buganda was on fire, Bukenya kept his allegiance to Museveni and the stablishment, now Bukenya like Kazibwe is thrown out! How hard to please Museveni. However, for the Uganda politicians the lesson is that politics should not be a life time job. Come serve and go, once you don't go naturally, you face the disappointment. Prof. Bukenya’s resignation is expected to be confirmed today when President Museveni meets the NRM Parliamentary Caucus to discuss his new Cabinet. A renown academic and scholar, Prof. Bukenya had a meteoric rise to the top of the political tree but his stint as the longest-serving VP under Museveni has been marred by allegations of corruption – which he denies – and colourful revelations about his private life. Prof. Bukenya’s sacking comes after Parliament yesterday ordered ministers who were recently re-appointed by President Museveni without parliamentary approval to vacate offices as MPs voiced concern over the delay to constitute a new government. While State House did not have an explanation on the delays to appoint a new government, sources told Daily Monitor last evening that the President had summoned the NRM Caucus for an impromptu meeting today at 7:30am, among others, to approve key Cabinet appointments. Although the 8th Parliament on May 11, a day before President’s swearing-in, had rejected Mr Museveni’s request to re-appoint ministers to their positions in acting capacity, it emerged yesterday that the “Acting” Prime Minister Apolo Nsibambi, writing on behalf of the President on May 16, asked the ministers to stay in office. Speaker Rebecca Kadaga told the House that the President wrote to her in the last week of the 8th Parliament, re-appointing ministers, a move MPs insisted was illegal. “I have a letter from the President, he communicated to me. If you want the letter I can bring it.” But when she brought the letter at 3pm, she only waved it and promised to share the details with the members after the session. She later adjourned the House at about 6:40pm without showing them the alleged letter from the President. A copy Daily Monitor obtained shows that the same letter Prof. Nsibambi referred to in the House on May 11 when Parliament rejected President’s request was the same letter Ms Kadaga brought. However, the date on the “new” letter was changed to read May 16 instead of April 8. MPs were concerned that in a letter tagged as “Most Urgent” from the Prime Minister communicating President Museveni’s decision, a specific Article of the Constitution empowering the President to re-appoint ministers in acting capacity in a new government and without the parliamentary approval was not indicated. The deputy Principal Private Secretary to the President, Mr Kintu Nyago said: “It’s within his (President Museveni’s) right. He is the one with the mandate to appoint ministers. Those people (complaining) can sue him. He received advice from the minister for Constitutional Affairs.” Meanwhile FDC Leader Dr. Kizza Besigye will today name the leader of opposition in parliament. AMAMA MBABAZI FOR PRIME MINISTER? CAN THE MANAGERS OF KAMPALA CHANGE THE CITY?